There’s something quite curious about beavers. They are the engineers of the animal kingdom. Cutting down small trees and constructing dams that they use as homes. Sometimes these dams help create wonderful lakes and ponds. Sometimes their endeavors hurt crops and dry up watering holes. The pair in this vintage beaver drawing are quite busy constructing their home. Beavers generally grow 2-3 feet long and their tails extend a further foot beyond that. They create an open area or chamber within the dams that are typically 7 feet wide. The entrance is underground. 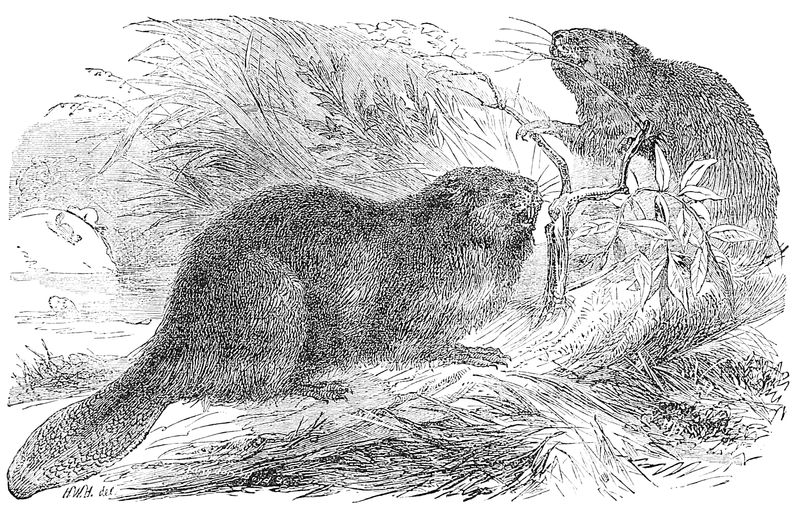 The vintage beaver drawing I found in the American Agriculturist from February 1867, shows a pair of castor Canadensis (the scientific name for beavers) gathering branches to create their home. The beaver engraving was available in a nice, large size; too big to show here. Just click on the one here to access the biggest version of the file.